also intends to use various engagements to develop relationship with institutes starting with knowledge awareness initiatives, student projects, curriculum enablement development tuned to current industry needs and collaborative research. faculty and professionals. Campus Associate will be interacting with industry experts, successful entrepreneurs and peers from across the country. opportunities, and are rewarded with awesome perks. What’s not to like? Join the team today! 12 months, the estimated time commitment is approximately 5-7 hours a week, with some variations throughout the term.  Express your passion for providing a student voice and helping your peers. with excellent communication skills. He/she should also be well networked and be able to engage with a variety of audience. Organizing and resourcefulness skills will also be an added advantage. 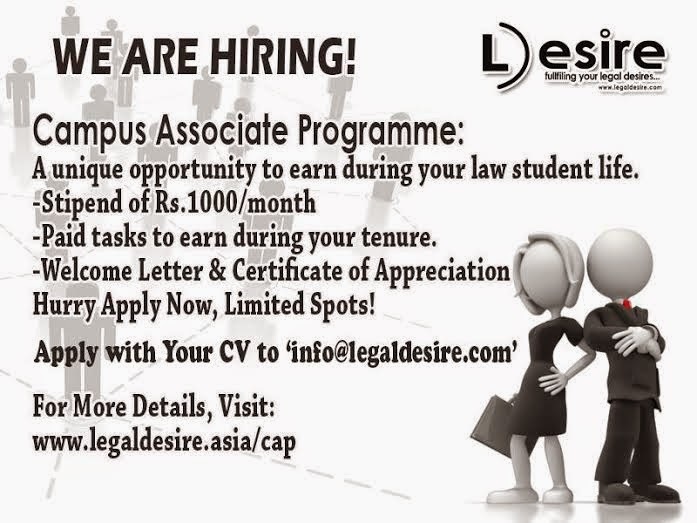  Promoting Legal Desire in your Institution and various Social Media Platforms. organizing a workshop/seminar at your campus.  Make people aware of Legal Desire through social media and other resources you have.  Submitting Articles and Research Papers. Monthly Magazine ‘Legal Desire Reporter’.  Promoting Legal Desire Online Courses and earning flat 10-25% commission. helping us organise events with sponsorship from your college. website. You will be given recognition for the same.  Collect feedback about legal desire from your faculty, students etc.  Submit reports/pictures of events that take place in and around your campus.  Share the latest campus happenings with Legal Desire.  A unique opportunity to earn during your student life.  Stipend of Rs.1000/month paid on completion of half tenure.  Paid tasks to earn during your tenure.  Coffee with Founder and Legal Professionals.  Recognition of active Campus Ambassadors on our website. Desire Team to report the event with our Media Team.  Free Legal Desire Shopping Credits to shop online law books and other services.  Free Discount Vouchers for Online Certification Courses conducted by Legal Desire.  Legal Desire Goodies & Gift Hampers. the selected applicants will receive confirmation email and contract of work. Submit your resume with contact details to info@legaldesire.com with subject headline ‘Application for the post of Campus Associate’.